This is a question we get asked every day. 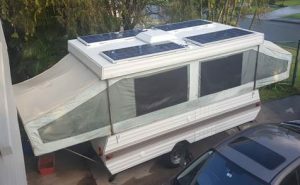 With most caravaners these days spending more time off the grid compared to being plugged in at a caravan park, solar becomes their primary charging source. Caravan manufactures today are generally installing a single 150w panel on their on-road caravans and 2 x 150w panels with an option of a third on their off-road units. For the on-road customer, a single panel is generally ok. This is because the van spends 95% of the time plugged in to AC power. The other 5%, the single 150w panel should cover the fridge load and supply a small charge to the battery. If you fridge runs on gas, then the single panel will keep the battery charged providing no other loads are running that exceed the output of the solar panel. For the off-road guy, they are spending a large portion off the grid and the solar is a major charge source for these customers. 2 panels will keep the fridge going and some minor loads and help keep the battery charged. A third panel will allow for more loads or help when you have partly overcast days. With this much drop in output, extra panels are needed to make up the shortfall. If the van has enough space on the roof to install more solar, then install as much as you can fit and afford. If roof space is limited, then strongly consider one or two portable solar kits to add to the setup. Also, if you happen to be camped up and have heavy overcast/raining conditions for 2-3 days, the solar is barely operating and the battery will drain down. Here you will have no choice but to plug in an alternate charging source. With an oversized solar setup, you have a good chance of producing a reasonable charge rate in these conditions without the need to plug in that alternate charge source. The other advantage is when the sun does come out, the system will recover the batteries far quicker from the losses of the previous day/s. For caravaners that rely on their solar as there No 1 charge source, you can never have too much solar. 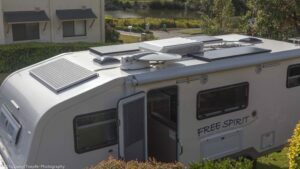 With the cost of solar these days compared to 10 years ago and the advancement in solar technology, a 600W system for example on an average off-road caravan should be able to self-sustain you in the field for days/weeks in the varying weather conditions we see in this great country of ours.